How can neuroscience inform the preparation of teachers? In a more recent article "Rest is Not Idleness: Implications of the Brain's Default Mode for Human Development and Education," Immordino-Yang, Christodoulou & Singh (2012) advocate for teaching & learning practices that promote greater balance between internal reflection and external attention; in this article, they coin the term, "constructive internal reflection." 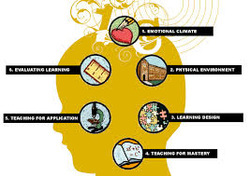 Want to learn more about the clear relevance of neuroscience to teaching/learning in schools? Neuroscience & the Classroom: Making Connections "is a free-of-charge distance-learning self-contained course that is distributed by the Annenberg Foundation. The course was designed by Kurt Fischer, director of the Mind, Brain, and Education Program at Harvard University Graduate School of Education; Mary Helen Immordino-Yang, assistant professor of education at the Rossier School of Education and assistant professor of psychology at the Brain and Creativity Institute, University of Southern California; and Matthew H. Schneps, George E. Burch Fellow in Theoretic Medicine and Affiliated Sciences at the Smithsonian Institution and director of the Laboratory for Visual Learning at the Harvard-Smithsonian Center for Astrophysics (CfA). This multimedia course involves six units; each unit includes numerous integrated videos, with sidebars that include additional information, and resource lists" (http://www.learner.org/courses/neuroscience/about/about.html). "Until teacher preparation programs are reconceived to incorporate relevant research from the neuro- and cognitive sciences, teachers need translation and guidance to effectively use information about the brain and cognition. Absent such guidance, teachers, schools, and school districts may waste time and money pursuing so called “brain-based” interventions that lack a firm basis in research. Meanwhile, the success of our schools will continue to be narrowly defined by achievement standards that ignore knowledge of the neural and cognitive processes of learning" (Hardiman et al., 2010). In order for any research, especially current brain research, to become readily accessible to teachers, fragmented initiatives must be integrated into a cohesive model of instruction. Brain-Targeted Teaching® is designed to meet this need. It provides teachers with a format for using research in the neurosciences as well as research-based effective instructional practices to guide them in planning, implementing, and assessing a sound program of instruction. The model also assists administrators, supervisors, and professionals supporting instruction as they guide teachers in implementing research-based effective teaching strategies. In just a few decades, we have come from the first articulations of the brain as a social organ, to a broad understanding of neural networks, regulatory systems, and biochemical processes that serve human relationships…The old notions of the brain as machines or computers are inadequate in the face of the social-emotional processes woven into the ways we process information. In the face of all of these findings, educational theorists must address the essential inextricability of intellectual, emotional, social processing that places secure attachment at the heart of learning (Cozolino, 2013, p. 70).